Vincent Van Gogh’s “Starry Sky” painted in June 1889. The whirls and curls evoke motion. The colors vibrate and oscillate like waves that come and go. There are rounded curves and borders in the tiny trees, the big mountains, and the blinking stars. Oceanographers call these rounded curves eddies when they close on themselves much as is done by a smooth wave that is breaking when it hits the beach in violent turmoil. Waves come in many sizes at many periods. The wave on the beach has a period of 5 seconds maybe and measures 50 meters from crest to crest. Tides are waves, too, but their period is half a day with a distance of more than 1000 km from crest to crest. These are scales of time and space. There exist powerful mathematical statements to tell us that we can describe all motions as the sum of many waves at different scales. Our cell phone and computer communications depend on it, as do whales, dolphins, and submarines navigating under water, but I digress. 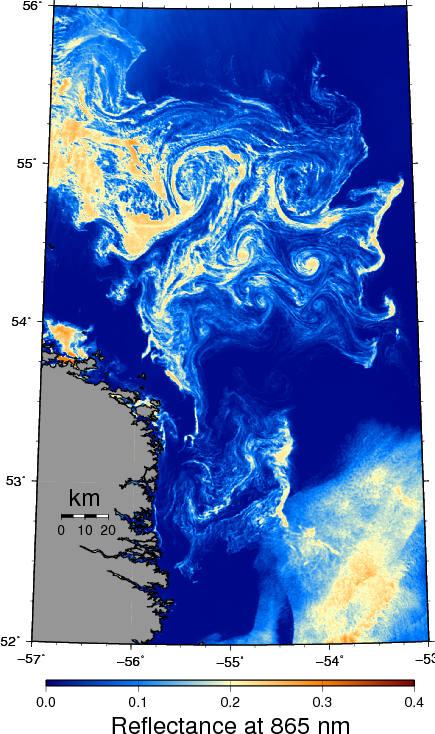 Ice in the Labrador Current as seen by MODIS-Terra on May 3, 2013. Blue colors represent open water while white and yellow colors represent ice of varying concentrations. Ice in the Labrador Current as seen by MODIS-Terra on April 6, 2008. Blue colors represent open water while white and yellow colors represent ice of varying concentrations. 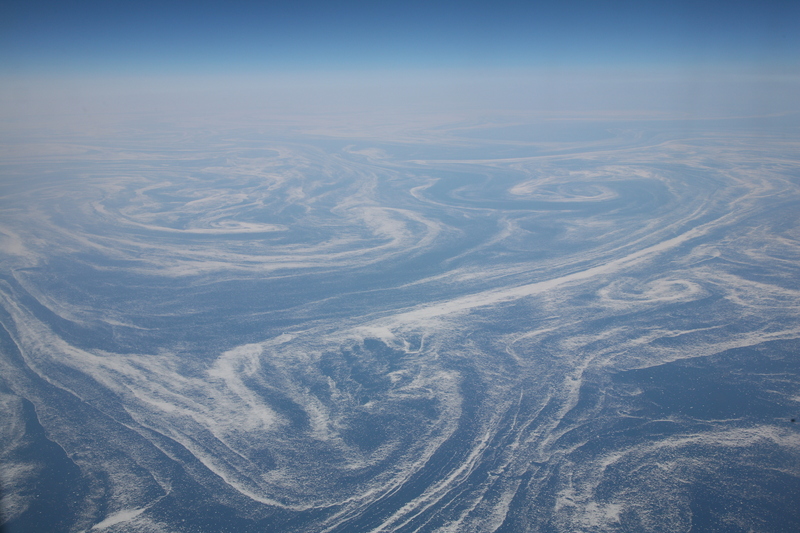 The swirls and eddies trap small pieces of ice and arrange them into wavy bands, filaments, and trap them. 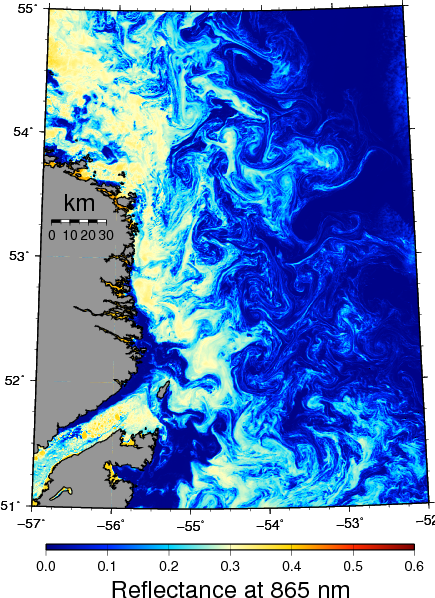 The ice visualizes turbulent motions at the ocean surface. Also notice the wide range in scales as some circular vortices are quiet small and some rather large. If the fluid is turbulent in the mathematical sense, then the color contrast or the intensity of the colors and their change in space varies according to an equation valid for almost all motions at almost all scales. 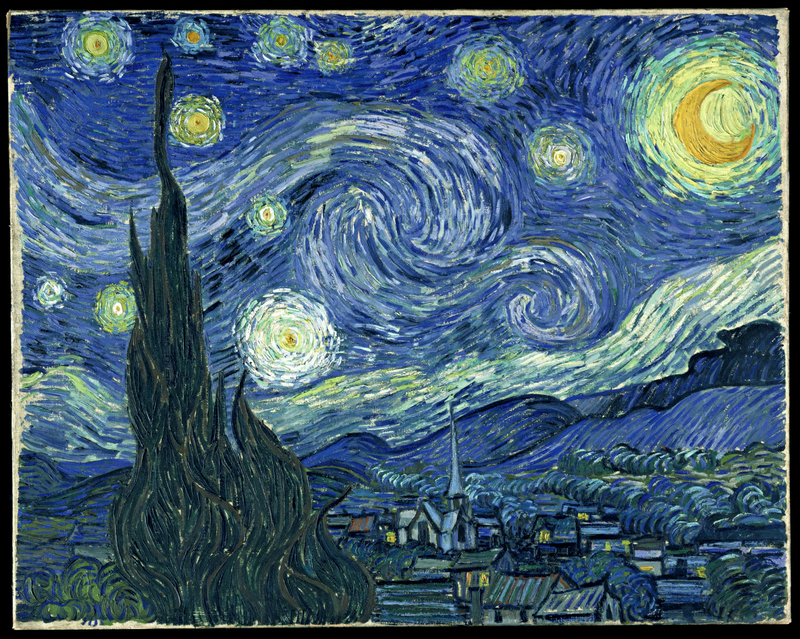 It is this scaling law of turbulent motions that three Mexican physicists tested with regard to Van Gogh’s paintings. They “pretended” that the painting represents the image of a flow that follows the physics of turbulent motions. And their work finds that Van Gogh indeed painted intuitively in ways that mimics nature’s turbulent motions when the physical laws were not yet known. There are two take-home messages for me: First, fine art and physics often converge in unexpected ways. Second, I now want to know, if nature’s painting of the Labrador Shelf Current follows the same rules. There is a crucial wrinkle in motions impacted by the earth rotations: While the turbulence of Van Gogh or Kolmogorov cascades energy from large to smaller scales, that is, the larger eddies break up into several smaller eddies, for planetary-scale motions influenced by the Coriolis force due to earth’s rotation, the energy moves in the opposite direction, that is, the large eddies get larger as the feed on the smaller eddies. There is always more to discover, alas, but that’s the fun of physics, art, and oceanography. Addendum Sept.-24, 2012: A New Climate State, Arctic Sea Ice 2012 (video by Peter Sinclair). 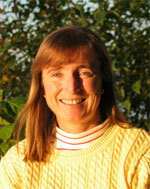 I just discovered an outstanding interview that Dr. Jennifer Francis of Rutgers University gave to a non-profit community radio station out of Vancouver, British Columbia. She connects and explains global warming, its much amplified signal in the Arctic, the extreme record minimal Arctic sea ice cover this summer, and how the warming Arctic and its disappearing sea ice impacts our weather in the northern hemisphere by slowing down the atmospheric jet stream separating polar from mid-latitude air masses. She explains all of this in non-technical language without loss of accuracy. If this program piques your interest and you want to read more, Andrew Revkin of the New York time has led an informed discussion at his New York Times blog Dot Earth. And finally, Climate Central presented and illustrated Dr. Francis’ observations and ideas rather well with graphics and videos. 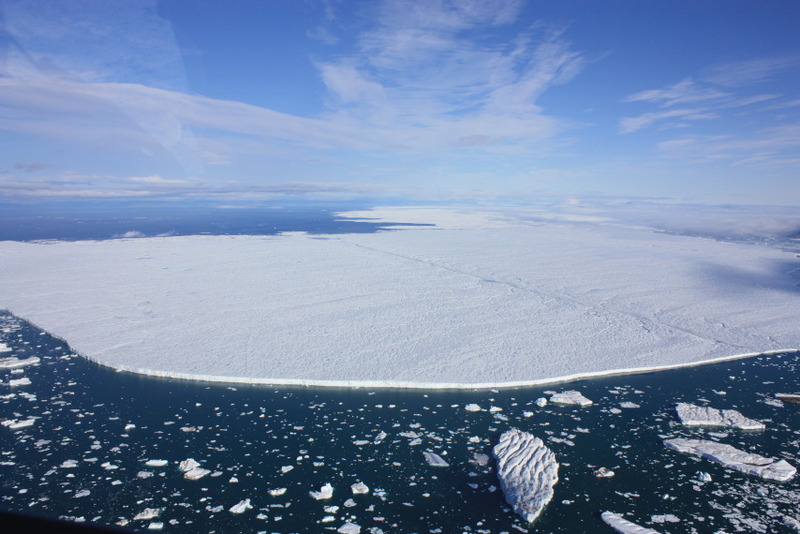 A new ice island separated from Petermann Glacier on July 16, 2012 as reported here first. Less than 4 weeks later, the Canadian Coast Guard Ship Henry Larsen reconnoitered the ice island on Aug.-9 when it blocked the northern half of the entrance of the fjord. Petermann Glacier, Fjord, and Ice Island as seen by MODIS at 865 nm on Aug. 07, 2012 overlaid with survey lines of CCGS Henry Larsen on Aug.-9/10/11, 2012 in red. 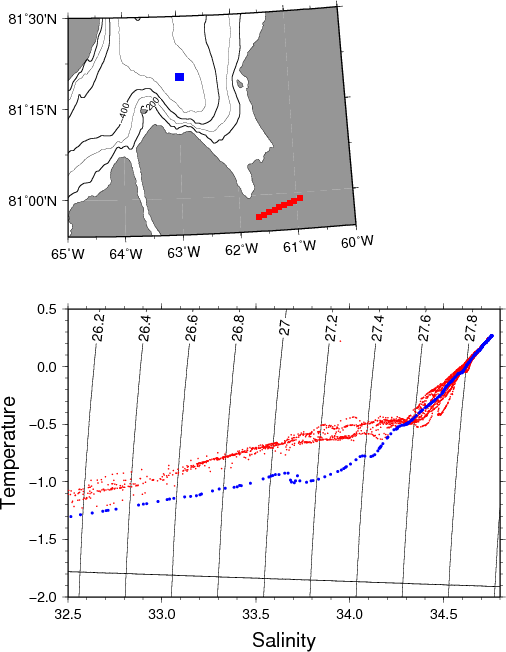 Temperature as a function of salinity from 9 stations across Petermann Fjord next to the current seaward edge of Petermann Glacier on Aug.-10, 2012 in red. For comparison I show in blue a station done outside the fjord on Aug.-9, 2012. Note that temperatures increase with increasing salinity which is expected for waters that are a mixture of cold and fresh polar and saltier and warmer Atlantic waters. 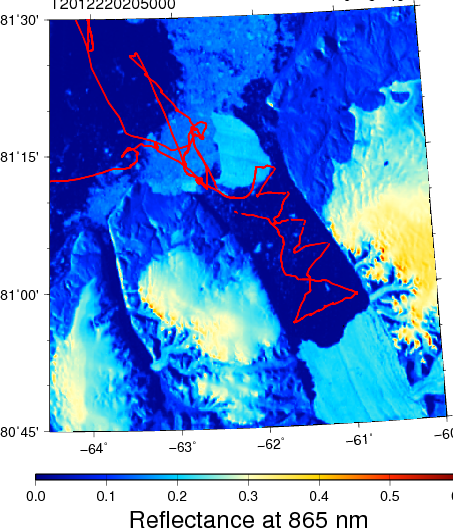 Density deviations from 1000 kg/m^3 are shown as solid contours along with the freezing temperature that decreases with increasing salinity. 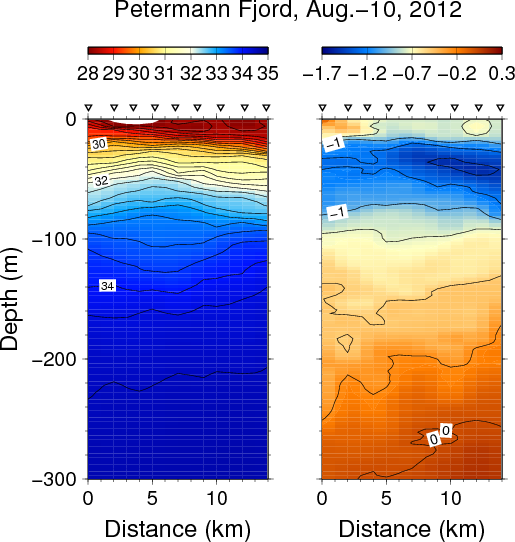 Section across the seaward edge Petermann Glacier on Aug.-10, 2012 for salinity (left panel) and temperature (right panel). Symbols indicate station locations from which color contours are drawn. Note that the display is cropped to the top 300 meters while real recordings extend to the bottom which exceeds 1000 meters. The view is eastward towards the glacier with north to the left. Note the doming salinity contours which to classically trained oceanographers suggest a flow out of the page on the right and into the page on left with maximum at about 90 meter depth relative to no flow at, say, 500 meter depth. Another way to view this distinct property distribution is that the flow above 90 meters is clockwise (outflow on left, inflow on right) relative to the more counter-clockwise flow below this depth. This feature, too, comes as a surprise and requires more thought and analyses to explain. Petermann Ice Island 2012 on Aug.-22, 2012 as seen by MODIS Terra at 21:45 UTC. The tiny red dot marks Hans Island, the location of a weather station in the Kennedy Channel section of Nares Strait. Petermann Fjord is towards the top right out of view. 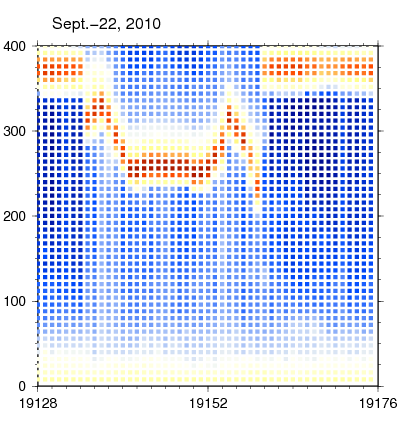 Time-depth series of acoustic scatter from a bottom-mounted acoustic Doppler current profiler for 24 hours starting Sept-22, 2010 9:30 UTC. 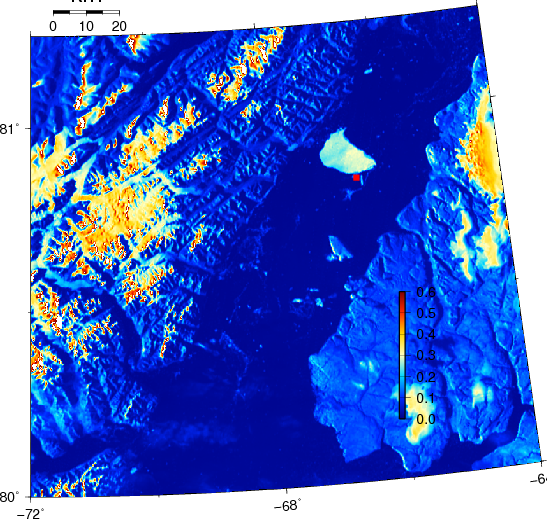 Red colors indicate high backscatter from a “hard” surface like ice. The vertical axis depth in meters above the transducers while the horizontal is ensemble number into the record (0.5 hours between ensembles). The 2010 ice island from Petermann Glacier (PII-2010B) passed over the mooring. 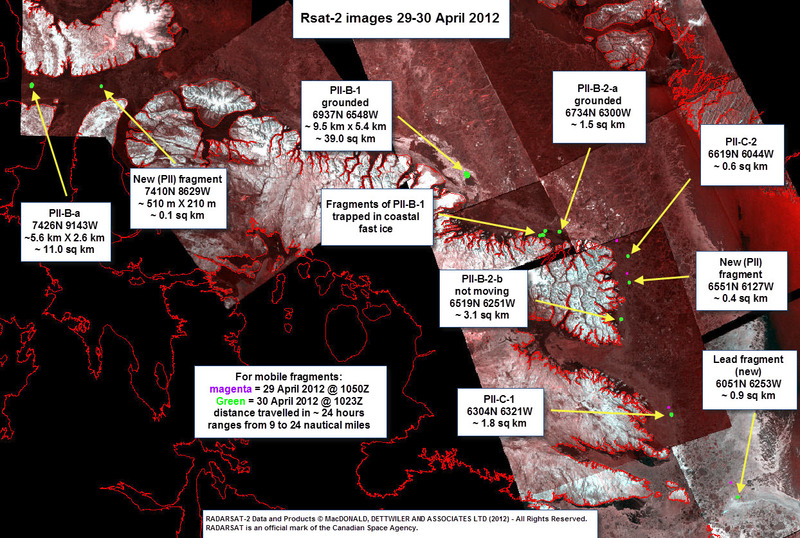 When PII-2010B was attached to the glacier it was adjacent to the segment that became PII-2012 this year. More icebergs and ice island from Greenland are heading south along northern North-America this year. Petermann Glacier’s first piece arrived last year off Newfoundland causing a local tourist sensation for a stunning display of ice along its shores. There are many more pieces from Petermann to come for a few more years. 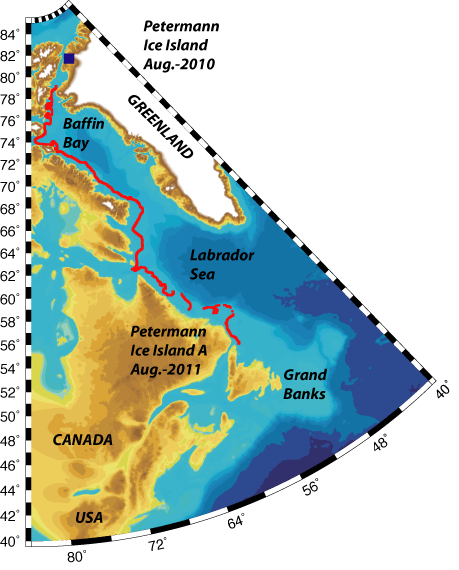 Track of Petermann Ice Island from Aug.-2010 through Aug.-2011 traveling in shallow water from northern Greenland along Baffin Island and Labrador to Newfoundland. Yet, how come that these arrivals are both so predictable in their pattern, but are almost impossible to pin down for an exact location and time? The answer involves mystical and fake forces, stunningly beautiful experiments, elegant mathematical equations, and, most important of all: spin. This makes no sense intuitively, but common sense and intuition help little when it comes to how the ocean’s water and the atmosphere’s air move on a rotating planet. For example, we all know intuitively that a down-pour of rain flows down a slope into the ditch. It requires work to bring water up to the top of a hill or into the water towers to make sure that water flows when we open the faucet. Not true for the ocean at scales that relate to climate, weather, and changes of both. Here all water flows along, not down the hill. Better yet, it requires no work at all to keep it moving that way for all times. This is why Greenland’s ice keeps coming our way as soon as pieces break off. The earth’s spin makes it go around the hill, to speak loosely of pressure differences. Winds and friction have little effect. The ocean’s natural and usually stable state is in geostrophic balance. Geostrophy is a fancy word for saying that the ocean’s water flows along, not down a hill, because it is balanced by a fake and mystical Coriolis force that I will not explain. I teach a graduate class on Geophysical Fluid Dynamics for that.